One of the top features of Sengled LED bulbs is the convenience they offer their users. The convenience in ordering it online and having it delivered to your doorstep from the Sengled website. The convenience of installing the light bulb which requires no certified electrician. Even the fact that you can control the light bulb with the easy to use Sengled app available for both Android and iOS. Dim the lights, increase or decrease the volume of your music on the Pulse Solo, view live scenes from your home (Sengled Snap) and many other exciting convenient options available for the Sengled smart bulb users. Whether you are in an office or your home, different occasions call for a different atmosphere. A more somber occasion requires more of a dimmed lighting. An eventful dinner might need brighter lights while a more serious encounter would require dimmer, warmer lighting. You can easily change the mood of your rooms with a flick of a button on your app. You can do this with the Sengled Pulse Solo which dims as per requirement, or with the Sengled Mood which offer two unique mood settings, the natural light, and the yellow glow. Now granted that not all smart bulbs can provide you with world class entertainment but there are those that do it so seamlessly you don’t need a separate home system. 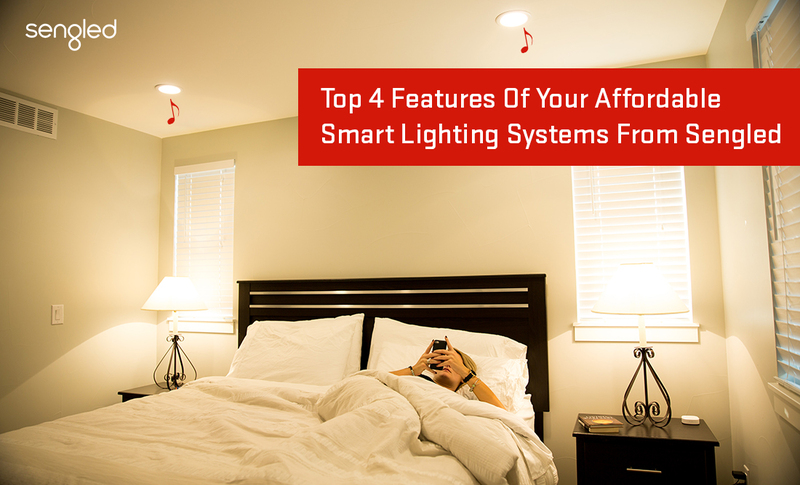 You can use your smart lighting systems to connect to your favorite devices like the Google Home Assistant, Amazon Alexa, and your phone to play your favorite tracks through your LED bulbs. The Sengled Pulse Solo, Sengled Pulse Set, Sengled Satellite are perfect examples of smart LED Lights that take advantage of this exciting feature. As per a multitude of studies, the lighting in your room has a profound effect on the quality of your sleep. Exposure to blue lighting can affect REM sleep which makes you feel groggy when you wake up. This is one of the most prominent reasons scientists suggest that you should stop the use of your phone (or use it in night mode) at least 2 hours before you get to bed. Automation in smart lighting systems can be set up to control the light colors especially during the night-time to increase melatonin levels as you get closer to your sleep time. This helps you wake up feeling well rested and ready for the day. Sengled’s affordable smart lighting systems give you access to a variety of features that your everyday LED bulbs cannot. Since price may be a major factor for many people before they buy smart LED light, Sengled has teamed up with Bunnings to offer special discounts on their products. Visit the website for more information. If you still have more questions, you need answered you can always get in touch with us via our social media channels or contact forms. Even if you leave us a comment, we’ll respond as soon as possible.